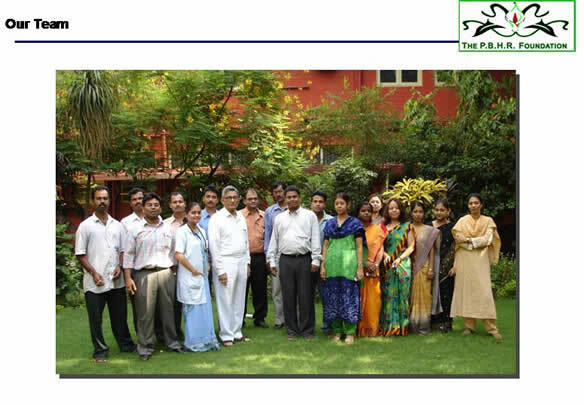 …by Prasanta & Pratip Banerji of The PBH Research Foundation, India. care only and some have advised for an integration of this therapy with conventional methods. However, in a study done by Sharples et al in 2003, it was found that orthodox medicine is not meeting the needs of some patients and that Complementary and Alternative Medicine (CAM) may wholly or partly substitute for conventional medicines. Most patients indicated their problem had improved with Complementary and Alternative Medicine (CAM). 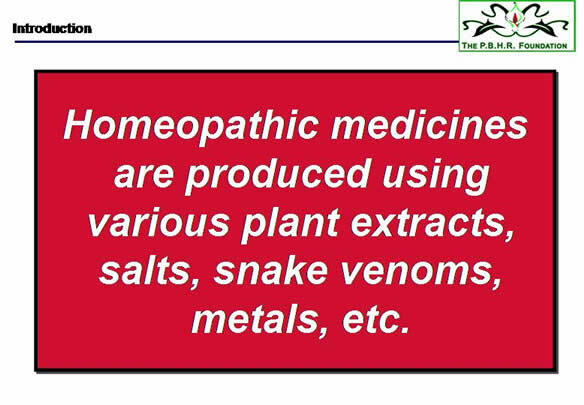 Homeopathic medicines are produced using various plant extract, salts, snake venoms, metals etc. and then by diluting the extracted mother tincture or the crude materials/ solutions as per homeopathic methods, which when ingested by healthy volunteers produce symptom complexes that mimic various diseases. These solutions are serially diluted and succussed until the desired potency is produced. 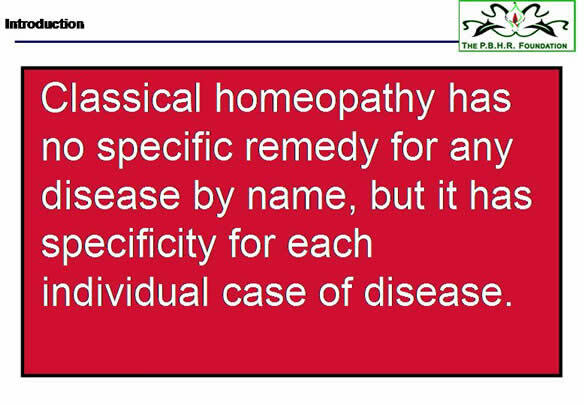 Classical Homeopathy has no specific remedy for any disease by name, but it has specificity for each individual case of disease. This approach of treating patients on the basis of symptoms only, is basically a must in long standing chronic diseases, and changes from patient to patient. A specific drug cannot be used for a specific disease. In general, when a Homeopathic Physician examines a patient, only a few medicines come to his mind. This small group of medicines exhibits similar symptoms on proving. Finally only one is selected as a result of practical experience and this procedure requires a long time. In an interesting study done by Becker-Witt et al in 2004, it was shown that a typical homeopathic initial consultation took 117 +/- 43 minutes for each adult patient and 86 +/- 36 minutes for each child patient. Ours is a new method of treatment. Specific medicines are prescribed for specific diseases. Diseases are diagnosed using modern/state of the art methods. 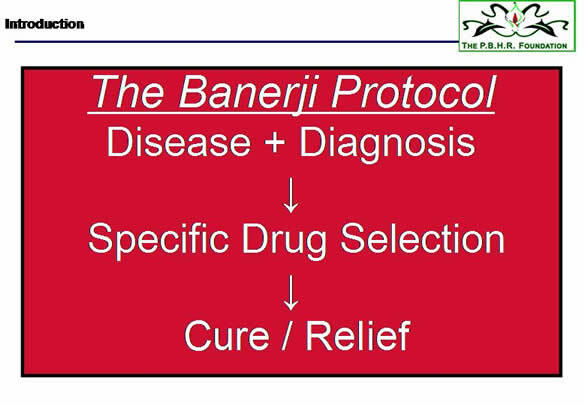 This is done because modern diagnostic approaches incorporate and help in the selection of medicines so that specific medicines can be easily prescribed for specific diseases. With the passage of time and the availability of new diagnostic tools like Ultrasonography, MRIs, cancer markers and other advanced tests, we have been able to further streamline the treatment protocols accurately. The efficiency of this streamlining is reflected by the encouraging results of our new method of treatment. We often combine two potentized medicines and use the combination in our practice. This combination of two potentized medicines, are made in a meaningful way based on years of clinical observations by us. They are combined for special advantages in treatment, so that the aggravation due to the medicines can be checked, side effects of the medicines abated, quick and uneventful recovery can be ensured in a much shorter time. Attempts to find out specific homeopathic medicine for a particular disease by many researchers in recent times also showed promising results such as the recent experiment on upper respiratory tract infections by Steinsbekk et al in 2004, clearly demonstrated that specific medicines were highly correlated with the homeopathically selected medicine. Similarly it was proved that homeopathic medicine Fluoric acid is a most effective preparation for radiation–induced itching in breast cancer patients. The National Institutes of Health (NIH), USA, was very interested in our research into various types of cancers and had asked us to produce records of our successes. 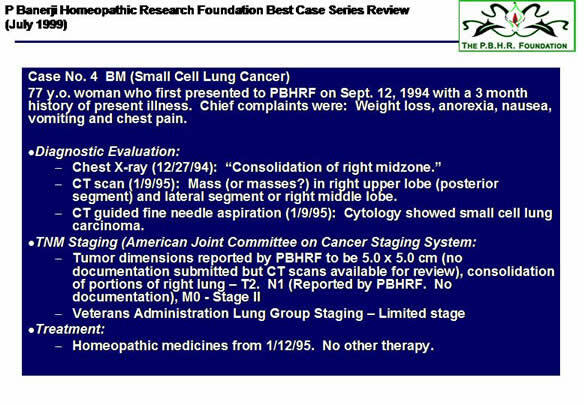 This we had done by submitting a “Best Case Series” on Cancer to the National Center for Complementary and Alternative Medicine (NCCAM) and the National Cancer Institute (NCI) at the NIH. On acceptance of our series, we were invited to present the same before the Cancer Advisory Panel for Complementary and Alternative Medicines in July 1999. 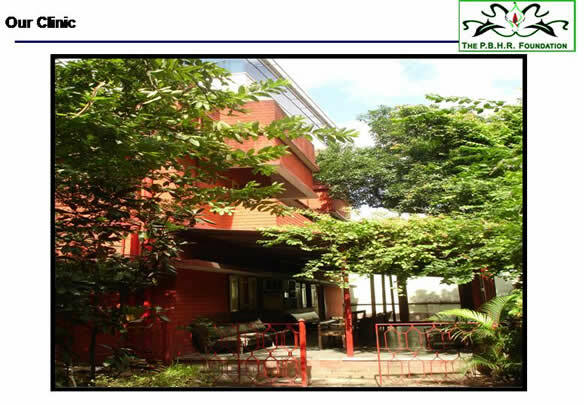 As a result of our presentation, the NCI, USA, is at present devising a “Practice Outcomes Monitoring and Evaluation Systems Study for Bronchogenic Carcinoma” at our clinic in Kolkata, India, with a view to arrive at a protocol for treatment of these cases at institutions in the US. Therefore, scientific progress demands that we continuously carry on more and more experiments and keep observational records. 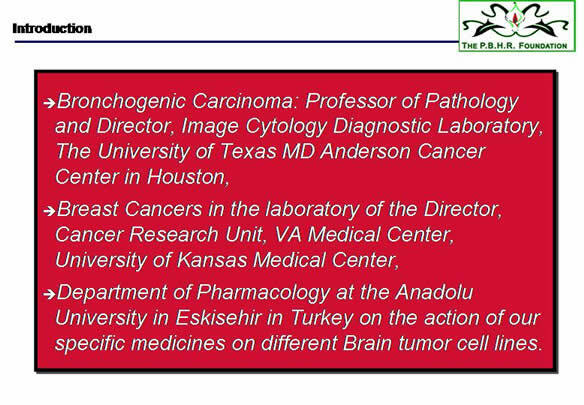 Along with the Professor of Cell Biology and Genetics, at the University of Texas MD Anderson Cancer Center, Houston, one paper has been published entitled “Ruta 6 selectively induces cell death in brain cancer cells but proliferation in normal peripheral blood lymphocytes: A novel treatment for human brain cancer” in the International Journal of Oncology in October 2003 where our method of treatment with Ruta and Calcarea Phosphorica was followed with excellent results. 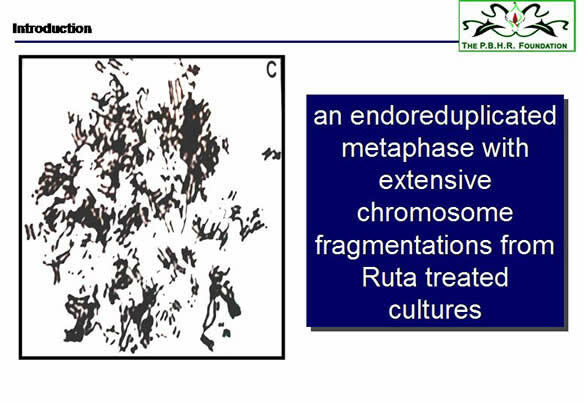 C, an endoreduplicated metaphase with extensive chromosome fragmentations from Ruta-treated cultures. 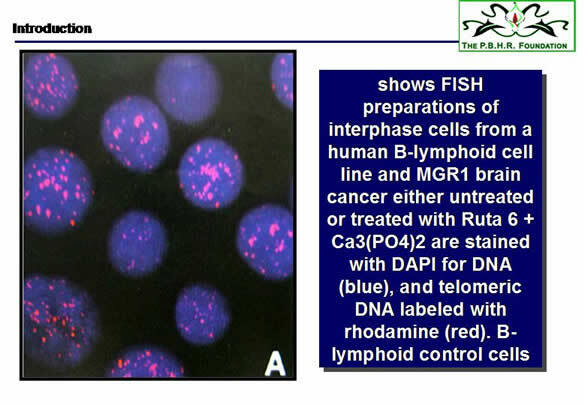 These slides show FISH (Fluorescent in-situ Hybridization) preparations of interphase cells from a human B-lymphoid cell line and MGR-one brain cancer either untreated or treated with Ruta 6 + Ca3(PO4)2 are stained with DAPI for DNA (blue), and telomeric DNA labeled with rhodamine (red). 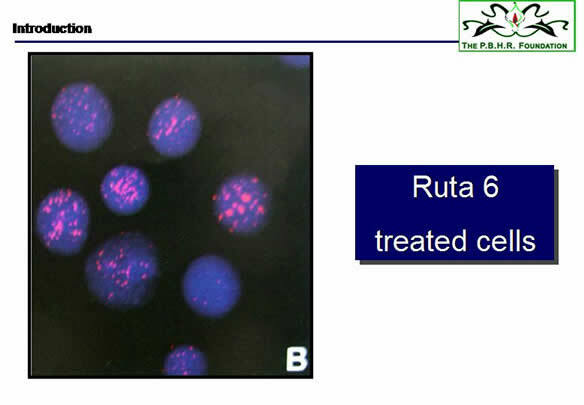 and Ruta 6-treated cells (B) both show no reduction in telomeric signals. 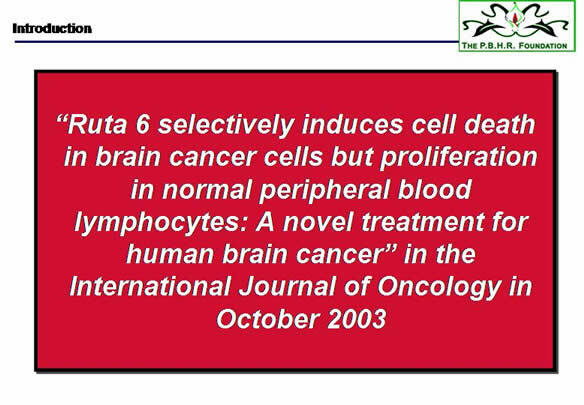 and Ruta-treated (D) … human brain cancer cells show significant difference in telomeric signals. 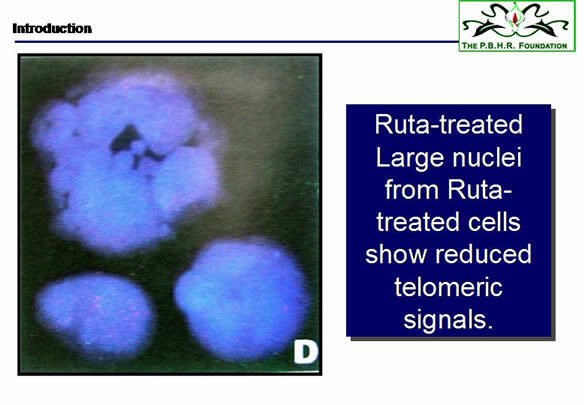 Large nuclei from Ruta-treated cells show reduced telomeric signals. All microphotographs were taken at the same magnification. Both in vivo and in vitro results showed induction of survival-signaling pathways in normal lymphocytes and induction of death-signaling pathways in brain cancer cells. 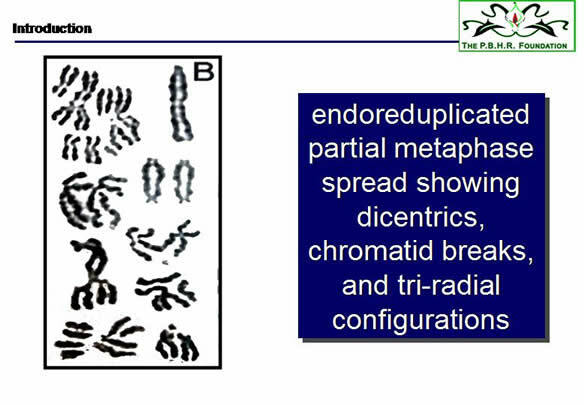 Cancer cell death was initiated by telomere erosion and completed through mitotic catastrophe events. We proposed that Ruta in combination with Ca3(PO4)2 could be used for effective treatment of brain cancers, particularly glioma. Of interest in this context is the fact that the brain tumor community in the US has shown an immense response to this protocol of treatment. We all know that patients suffering from serious diseases often acquire a good deal of knowledge about their diseases. Lately, we have been receiving 60 to 70 mails a day from patients all over the world who have found the paper on Ruta and in an uncontrolled manner have started taking the medicines themselves. When after 3 to 4 months of treatment, they find that their tumor has regressed or become static, they contact us to fine tune the treatment for them. Collaborative research work on Bronchogenic carcinoma is also going on in the laboratory of the Professor of Pathology and Director, Image Cytology Diagnostic Laboratory, The University of Texas MD Anderson Cancer Center in Houston, on breast cancers in the laboratory of the Director, Cancer Research Unit, VA Medical Center, University of Kansas Medical Center, and in the Department of Pharmacology at the Anadolu University in Eskisehir in Turkey on the action of our specific medicines on different brain tumor cell lines since the last one and a half years. We have treated thousands of cancer patients in the last four decades. 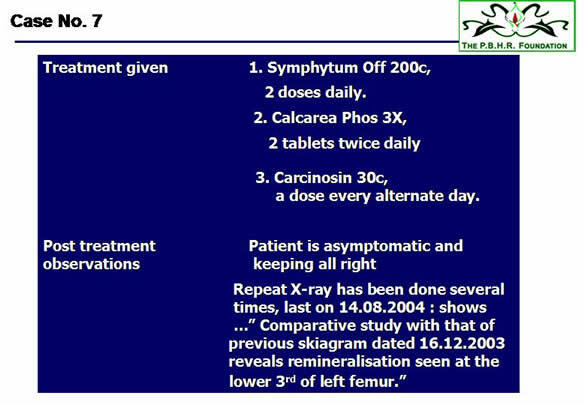 Here we now highlight some outcome of our treatment in the recent past. 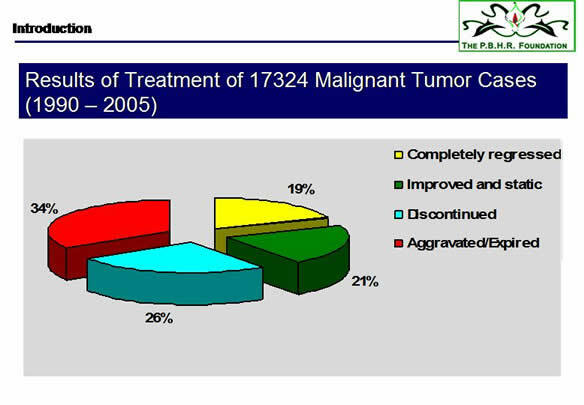 This Graph shows general outcome of treatment of 17,324 cancer patients from 1990 to 2005 at our clinics. 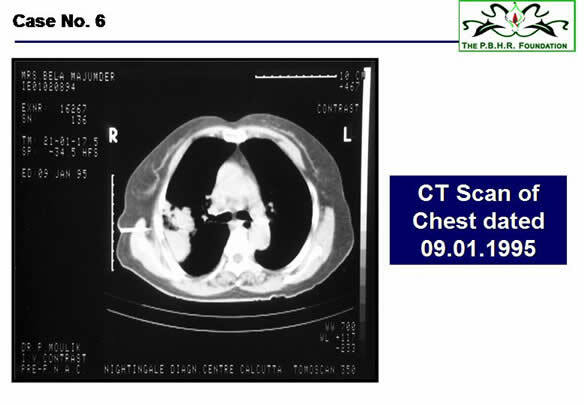 In 19% cases the malignant tumors were completely regressed which appeared to us very significant. In 21% cases they were static or improved after treatment. Over the last two years, there has been a spurt in the number of cancer cases visiting our clinics. 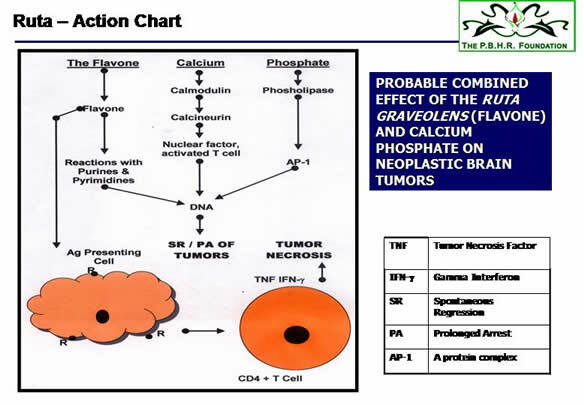 It may be mentioned here that the above in-house figure is mainly based on those cases with complete documentation such as scan plates, biopsy slides and such, and the actual number of cancer cases under our treatment exceeds this figure. On an average about 1000 new cancer cases are registered in our clinics every month and in December 2006 we have treated 1136 new such cases. 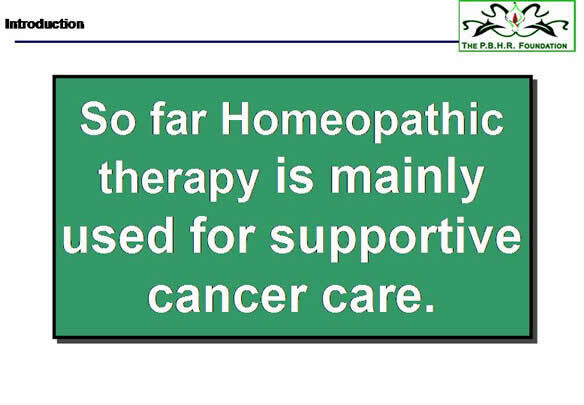 Thus presently it appears from all these findings that our new method of treatment with homeopathic medicines may be regarded as the future drug for cancer research and treatment for the benefit of mankind. Esophageal Carcinoma – These two patients suffering from esophageal carcinoma were treated with the homeopathic medicine Condurango 30c, prepared from the plant Marsdenia condurango. 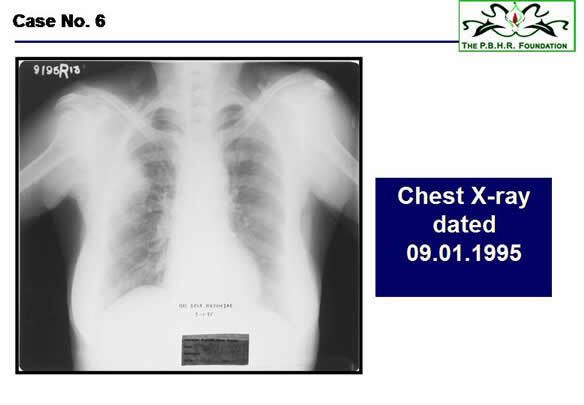 They were followed meticulously for several years and all original documents, radiological plates and histology slides were kept for reference. There has been no evidence of recurrence or metastasis in either of them. The patients are now in normal health. 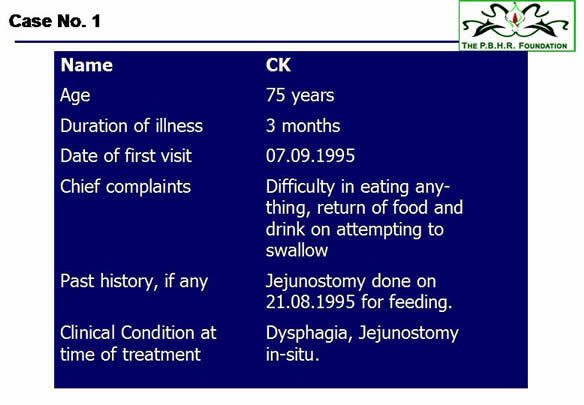 Mrs. C K, Female, aged 75 years was suffering for 3 months with difficulty in eating anything, return of food and drink on attempting to swallow, when she came to us for her treatment on 07.09.1995. 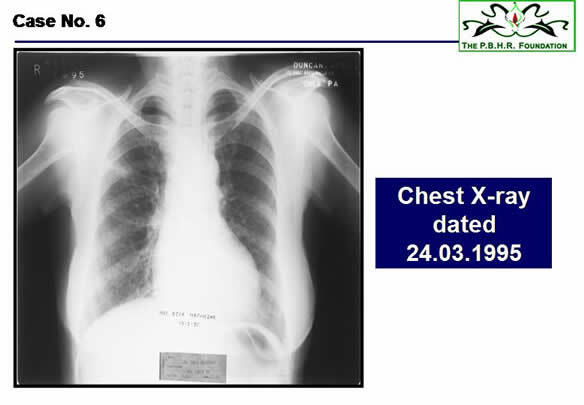 Clinically the patient presented with severe dysphagia, an emaciated state of health, food pipe fitted jejunostomy that was done on 21.08.1995. 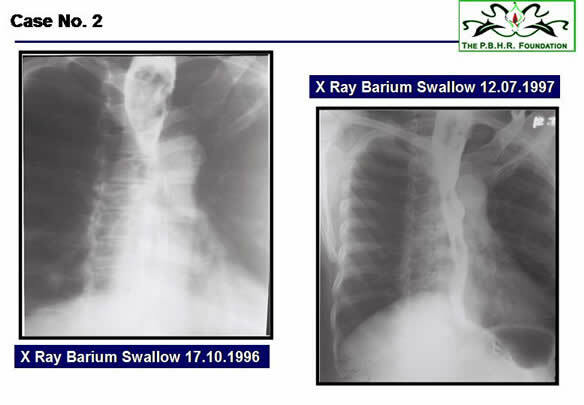 X-ray (Barium swallow of oesophagus) done on 19.08.1995 “…(Patient was too sick to stand and swallow Barium at the time of X-ray)…shows gross filling defect at mid and lower 1/3rd –MALIGNANT NEOPLASM”. 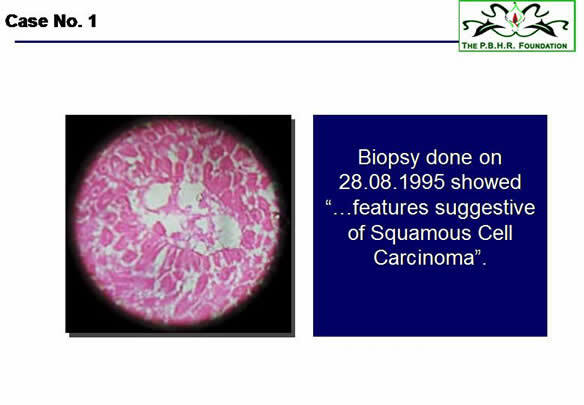 Biopsy done on 28.08.1995 showed “…features suggestive of Squamous Cell Carcinoma”. 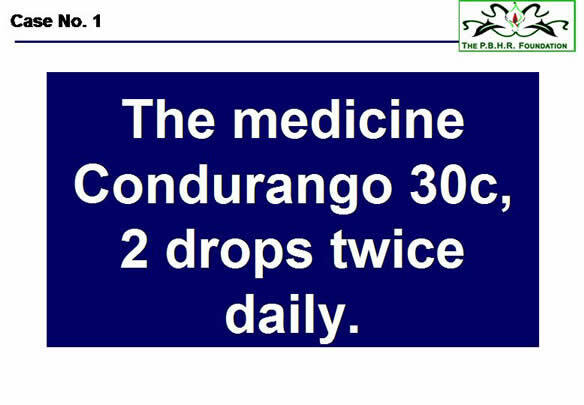 After undergoing treatment from us with the medicine Condurango 30c 2drops twice daily, the patient is asymptomatic and keeping alright. The jejunostomy was removed some time after the start of our treatment when the patient was found to have recovered from her dysphagia. 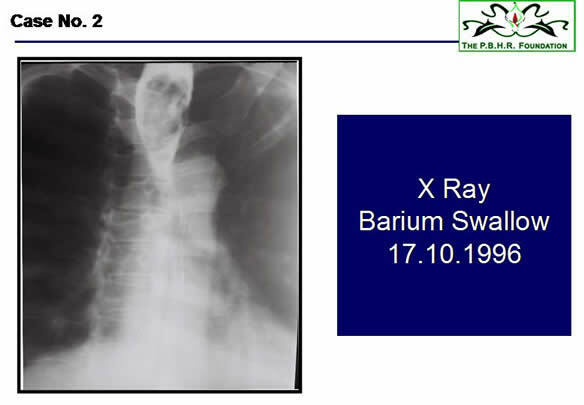 Post treatment repeat X-ray barium swallow done on dated 12.10.1995 shows “…There is no filling defect in oesophagus”. We are still reviewing the case every six months but there has been no recurrence. She is still living in good health. 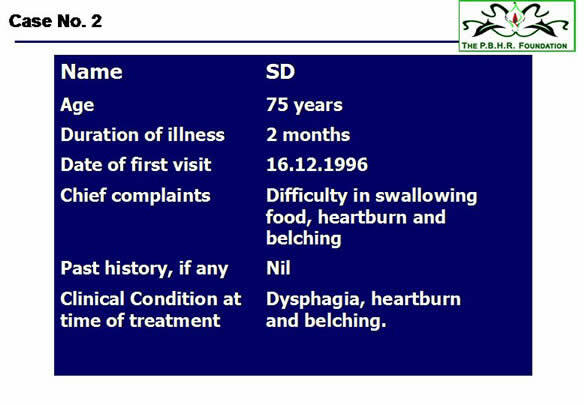 Mr. S D, male, aged 75 years was suffering for 2 months with difficulty in swallowing food, heartburn and belching, when he came to us for his treatment on 16.12.1996. 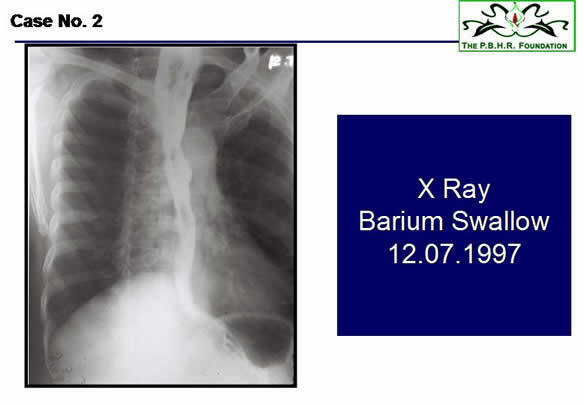 Clinically the patient presented with dysphagia, heartburn and belching. 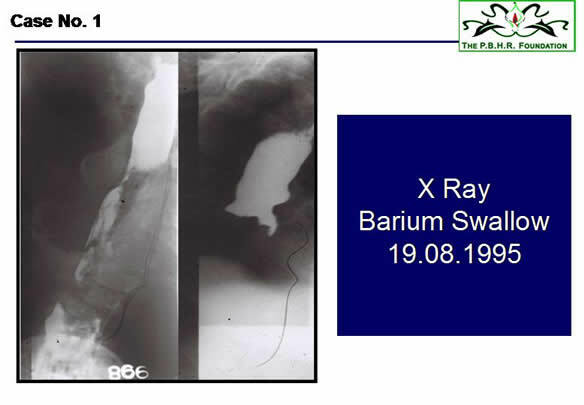 Endoscopy done on 29.11.1996 shows “…GE junction at 40cm. At 18 cm. is a growth extending upto 22cm. causing luminal narrowing”. 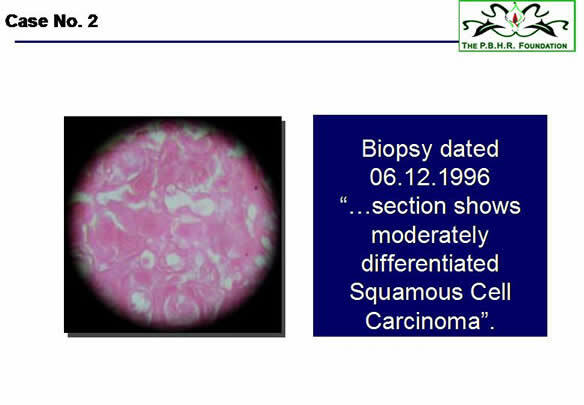 “…section shows moderately differentiated Squamous Cell Carcinoma”. After undergoing treatment from us with the medicine Condurango 30c 2 drops twice daily, Now the patient is feeling much better. He is keeping good health and does not complain of dysphagia any more. 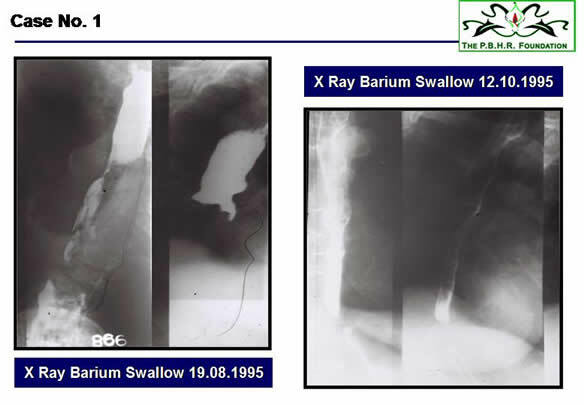 Post treatment barium swallow X-ray of oesophagus dated 12.07.1997 shows “… there is considerable improvement in the patency of the oesophagus”. 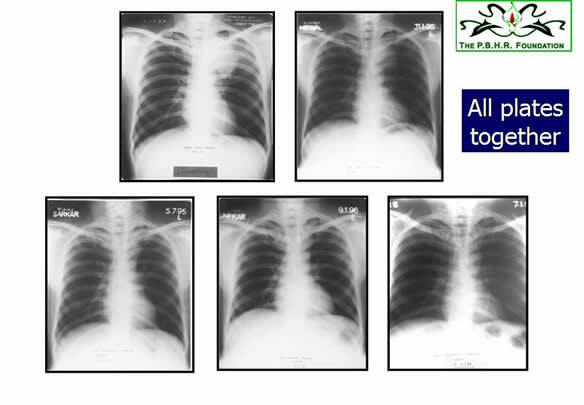 All plates together There were no complications during treatment. We are still reviewing the case every six months but there has been no recurrence. 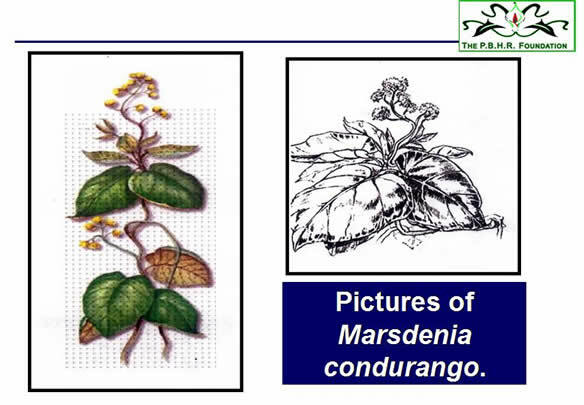 (Picture of Condurango plant) The botanical name of Condurango is Marsdenia condurango under the family Asclepiadaceae. 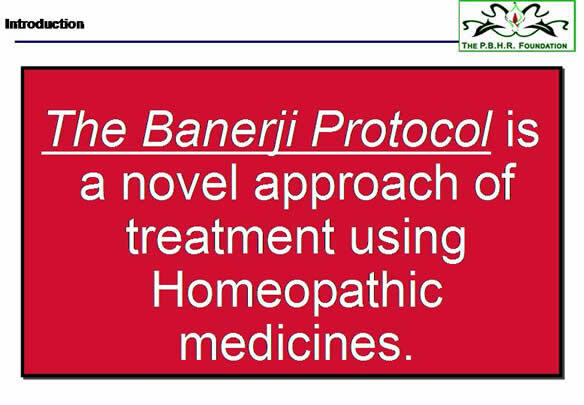 Homeopathic medicines are produced from the bark and the medicines used by us were procured from reputed Homeopathic medicine manufacturers. (Condurango chart) It is very difficult to explain the action of Condurango and how it helps in the regression of esophageal tumors. Condurango contains large amounts of tannins. Tannins (commonly referred to as tannic acid) are water-soluble plant polyphenols comprising a heterogeneous group of compounds. An increasing body of experimental evidence indicates that tannins exert anti-carcinogenic activity and can inhibit the proliferation of cancer cells and induce apoptosis. Tannins of Terminalia catappa, which is a folk medicine, can prevent lipid peroxidation, superoxide formation and have free radical scavenging activities. In these ways they can prevent cancer. It has also been observed that tannic acid dietary intake in low doses can produce a strong chemo-protective activity against spontaneous hepatic neoplasm development in C3H male mice, most probably through anti-promoting mechanisms. Considering all these facts it appears that tannins of Condurango prevents development of cancer by anti-promoting mechanisms, free radicals scavenging, decreasing lipid peroxidation and superoxide formation. 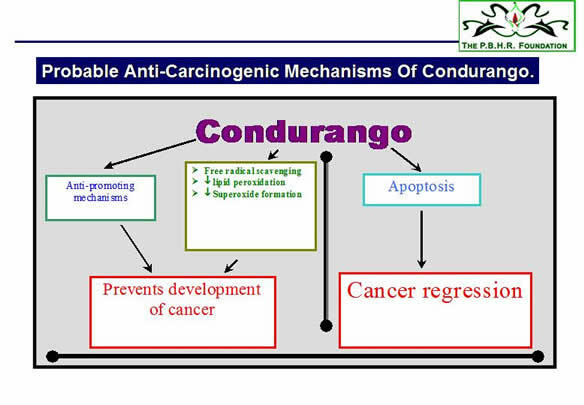 After development of cancer, tannins of Condurango can initiate apoptotic mechanisms in the tumor cells and thereby produce a regression in the tumor. Thus our findings indicate that Condurango is a medicine that can be used with reasonable confidence in the treatment of esophageal carcinoma. Incidence of tumors of the Brain, of its meningeal covering, and of the spinal cord ranges from 11 to 19 per 100,000 population. About one half of brain tumors are primary lesions derived from neurons, glia or their supporting meningo-vascular structures. 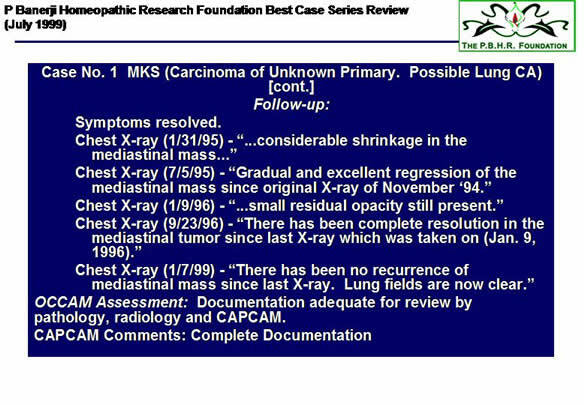 The remainders are metastatic lesions. As per traditional methods, treatments of brain tumors include maintenance medical therapy, surgery, radiation therapy, chemotherapy and immuno-therapy. In many cases, surgical removal of the tumor is impossible, in such cases, sometimes partial resection is effected. Response to radiotherapy and chemotherapy is poor in many cases, and in a good percentage of cases their administration in contraindicated. 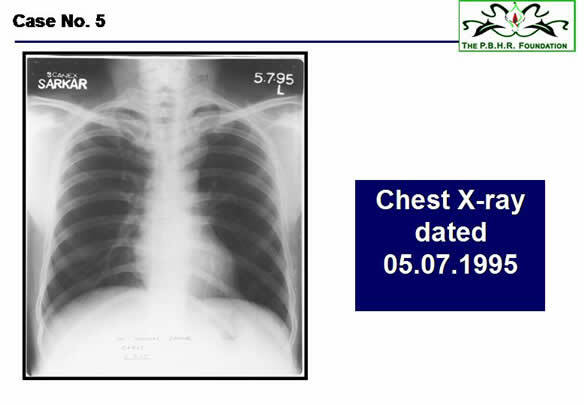 There are recurrences in many cases and good many cases show poor prognosis. 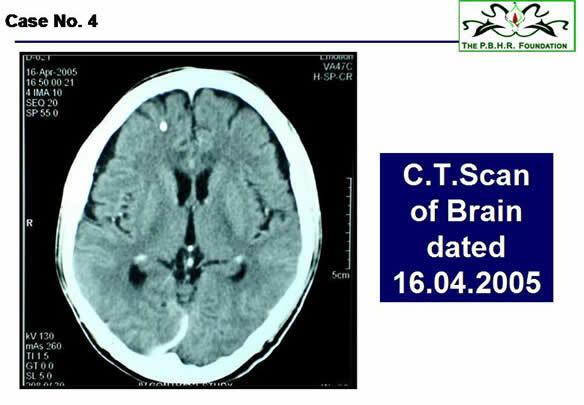 In our Research Foundation, brain tumor cases are treated successfully with Homeopathic medicines. 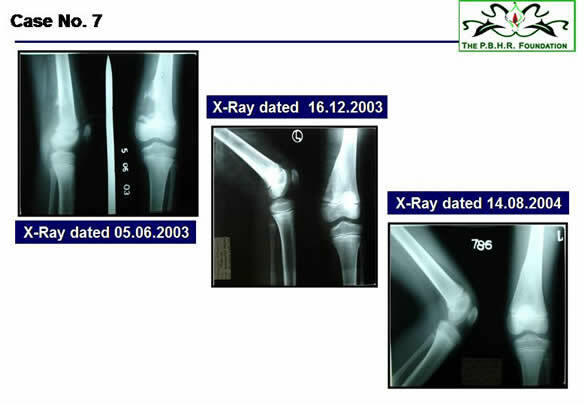 In our long clinical experience, we could give relief to a large percentage of cases, some of which subsequently exhibited complete regression. 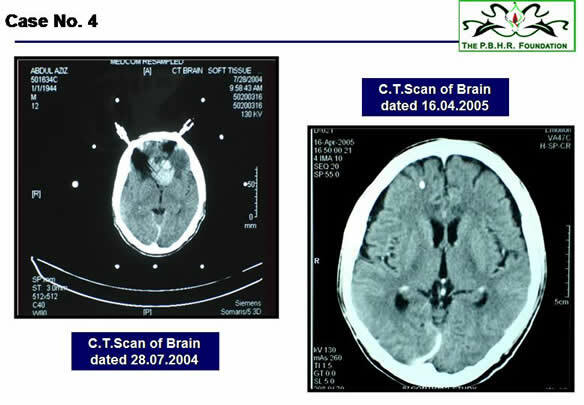 In this presentation a study of 2 cases treated by us have been offered utilizing all medical reports and information kept documented over the years, including CT scans before and after treatment. 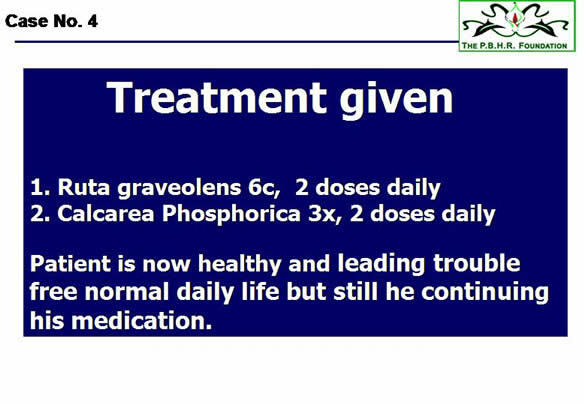 The cases have been treated by the medicines Ruta graveolens 6c and Calcarea Phosphorica 3x. 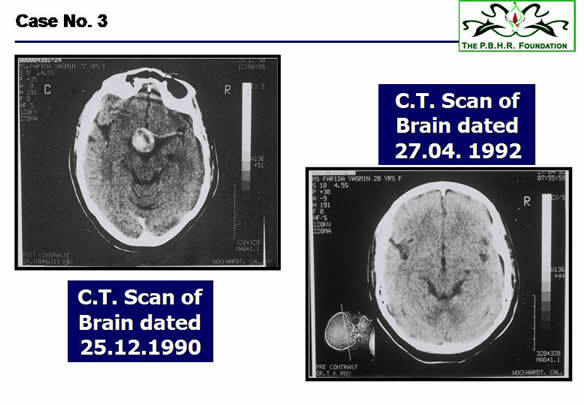 F.Y, female, aged 27 years in December 1990, was suffering for 4 years with occasional attack of headaches (since 1986). 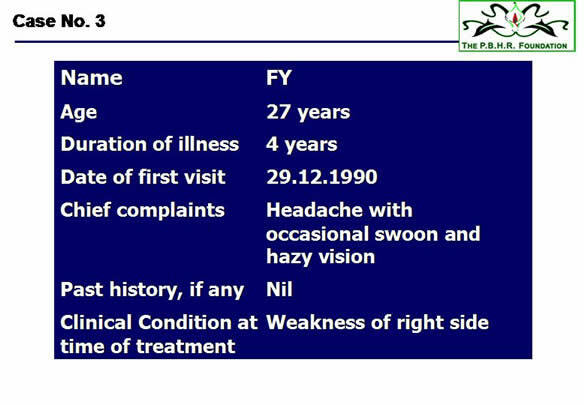 She had severe attack of headache worse on the left side on 17th Dec 1990 with swoon and hazy vision when she came to us for her treatment on 29th Dec 1990. 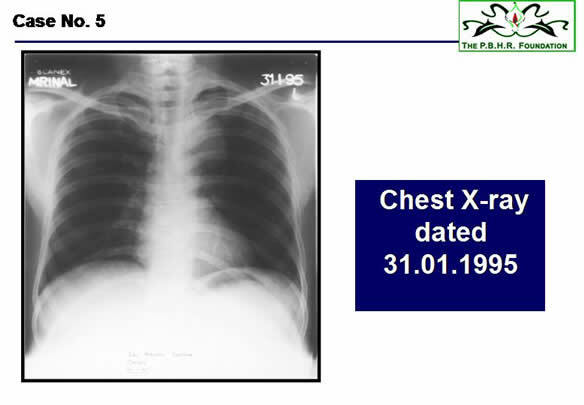 Clinically the Patient presented with haziness of vision, pain and weakness of the right side. C.T. 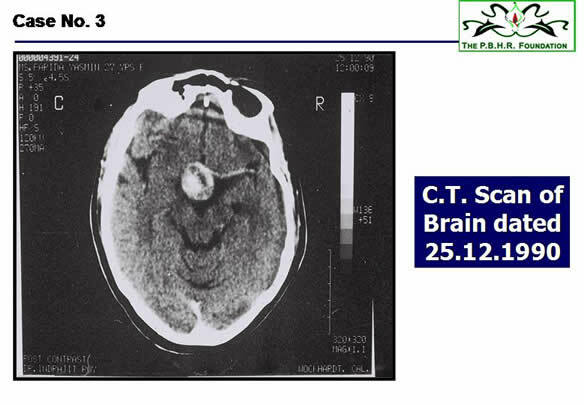 Scan of Brain dated 25.12.1990 – showed “The most significant abnormality is the presence of a mixed attenuating (hypo and hyperdense) well circumscribed mass at supraseller and intra-seller region producing marked expansion of the sella slightly more on left side. The fairly large mass measures about 2.2 cms in AP, 3.54 cms in transverse and 3.37 cms vertically as maximum dimensions. 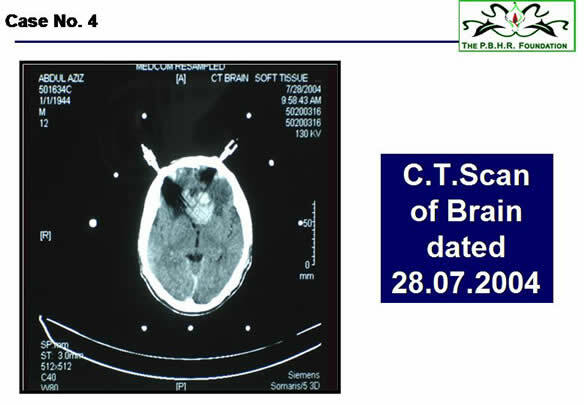 ?Craniopharyngioma, ? ?Pituitary macroadenoma”. After undergoing treatment from us with the medicines Ruta graveolens 6c and Calcarea Phosphorica 3x, Haziness of vision improved from the first month of the commencement of the treatment and vision has been completely restored now. Pain and weakness of the right arm completely recovered. She is now healthy and normal and enjoying life. C.T. 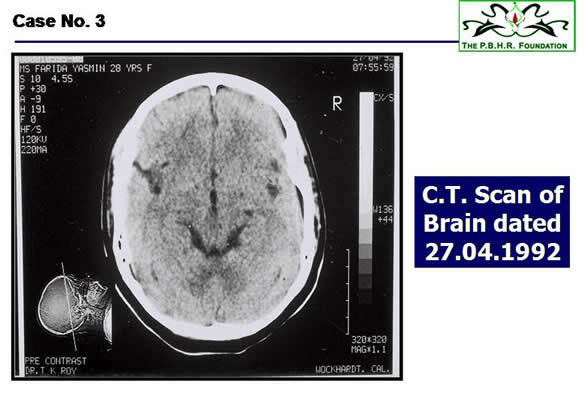 Scan of Brain dated 27th April 1992 - “Follow up case of a fairly large intrasellar mass with predominantly suprasellar extension now showing complete disappearance of the inhomogenously enhancing mass leaving behind normal appearances of the Pituitary gland and suprasellar cistern, since the last scan done on 25th Dec 1990”. 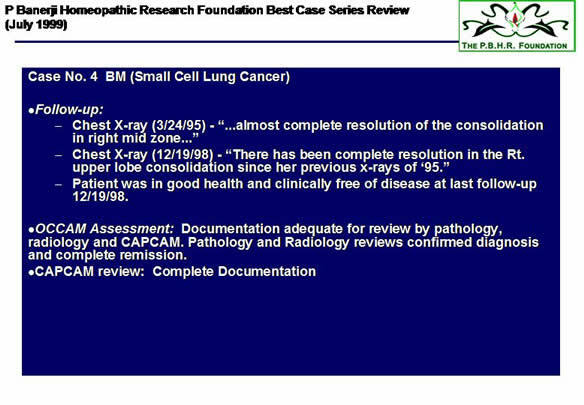 (Both Scans together) There were no complications during treatment. The husband of the patient visited us at the clinic on 30.11.1999. From him, we have learnt that the patient is keeping well and he has promised to bring her for a CT scan at the earliest possible. 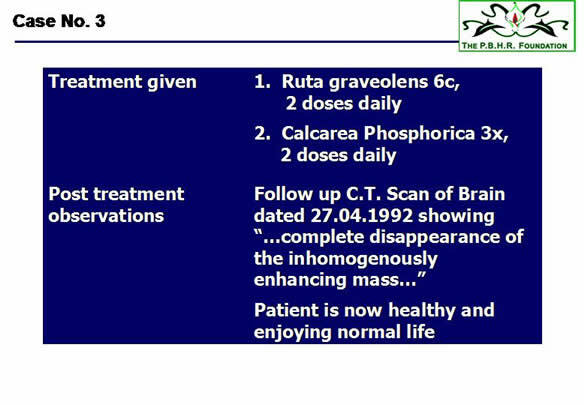 After undergoing treatment from us with the medicines Ruta 6c two doses a day, Calcarea Phosphorica 3X two doses a day, his all clinical symptoms were gone within 7-8 months. 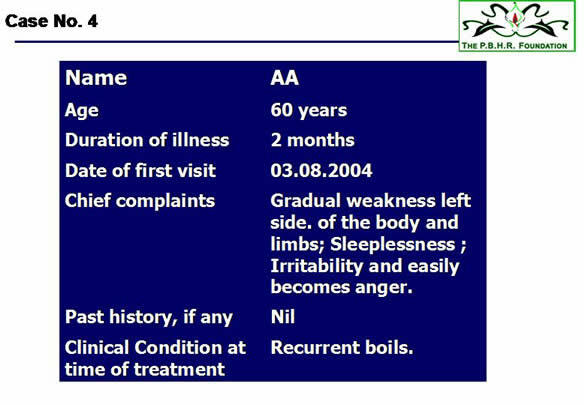 Till now patient is leading a trouble free, normal life but still continuing his medication. 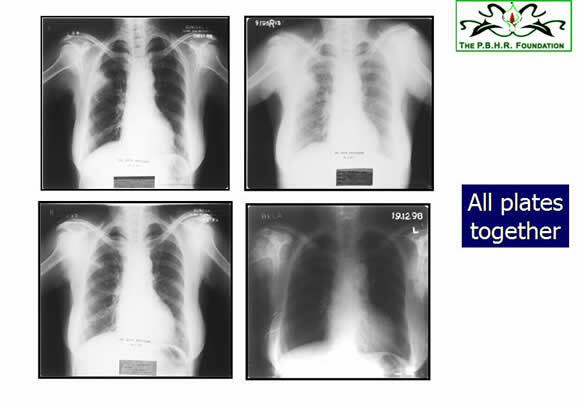 – All plates together There were recurrent boils during treatment. We are still reviewing the case every six months but there has been no recurrence. 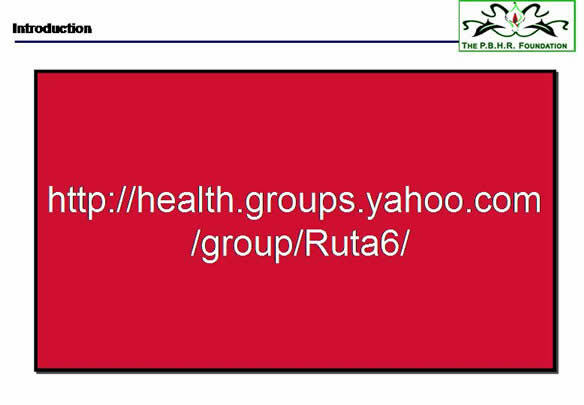 (Ruta action chart) Rutin, the active ingredient of Ruta, is known for its anti-oxidant and anti-inflammatory activities and also for reducing oxidative damage in a rodent model. 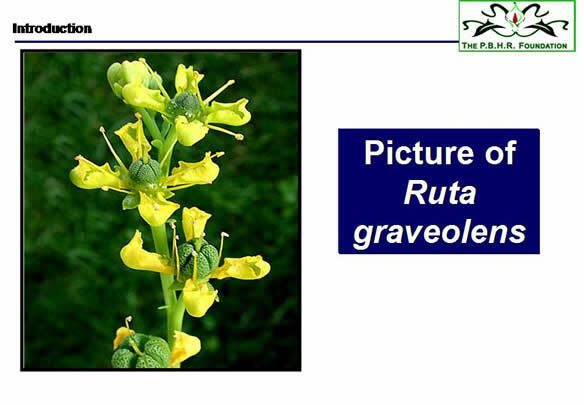 In addition, Ruta is also known to protect from DNA strand breaks and to prevent mutagenesis. Calcium phosphate activates phospholipase, which cleaves phosphalidylinositol biphosphate, a membrane bound molecule that activates protein kinase C. Thus one may consider these aspects for a possible explanation of such effects. 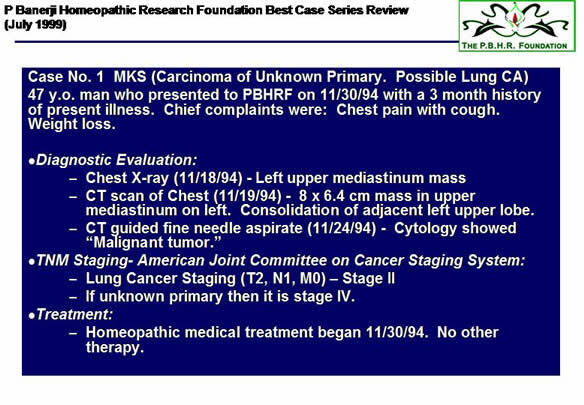 (NCI Slide 2) In the University of Texas MD Anderson Cancer Center Houston, it was described as a diagnosed case of Malignant Neoplasm. 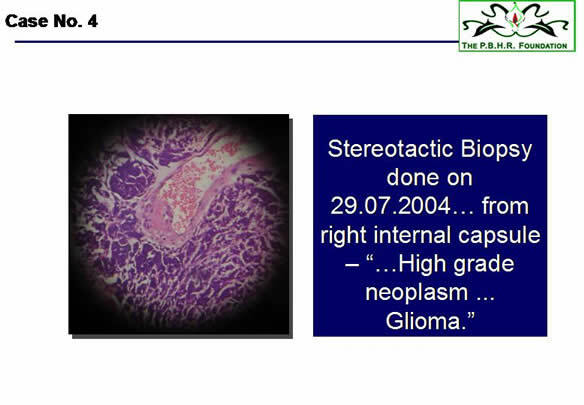 According to TNM classification of the tumor in this case, the growth was T2, N1, M0 – Stage II, if it was a case of metastasis from an unknown primary, then it would be staged at Stage IV. 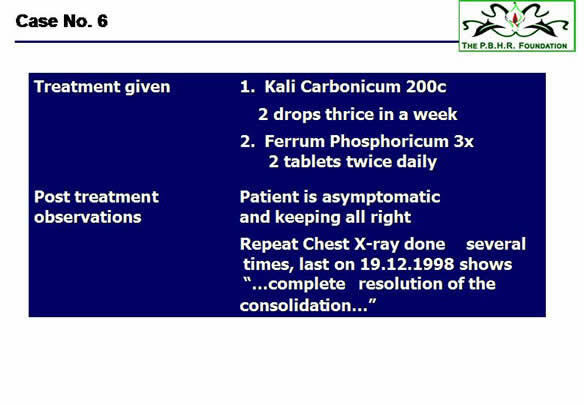 After undergoing treatment from us with the medicines Kali Carbonicum 200c 2 drops thrice in a week and Ferrum Phosphoricum 3x 2 tablets twice daily, Patient is now asymptomatic and living his normal life. 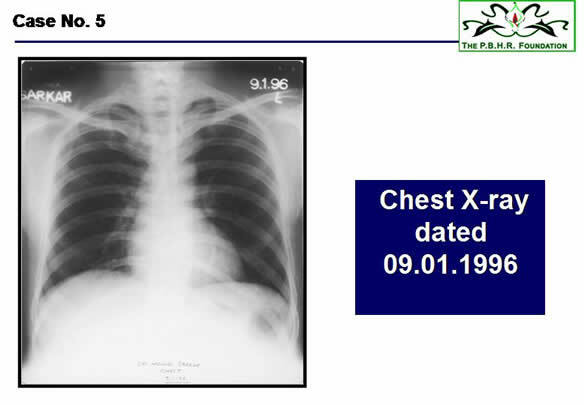 Chest X-ray was done on several occasions last on 07.01.1999, which shows that there has been complete resolution of the mediastinal tumor. There were no complications during treatment. 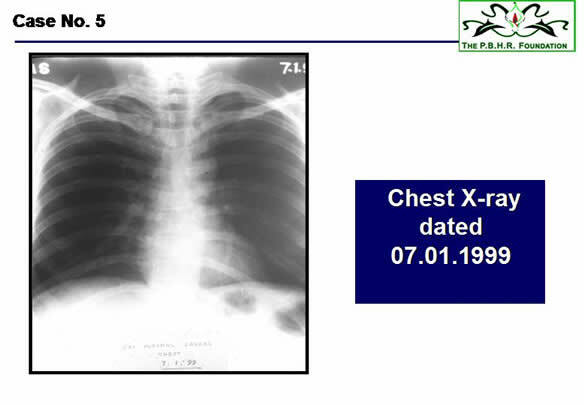 – All plates together We are still reviewing the case every six months but there has been no recurrence. 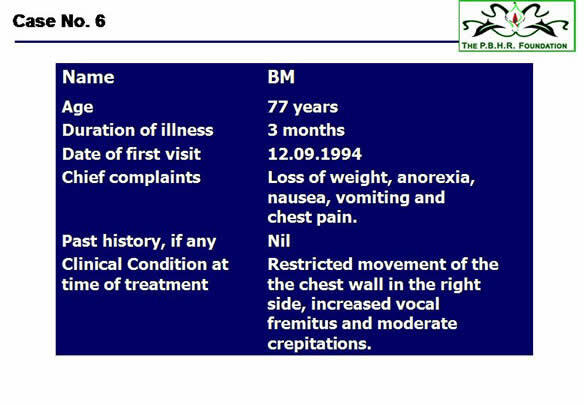 Mrs. BM, female, aged 77 years was suffering for 3 months with loss of weight, anorexia, nausea, vomiting and chest pain, when she came to us for her treatment on 12.09.1994. 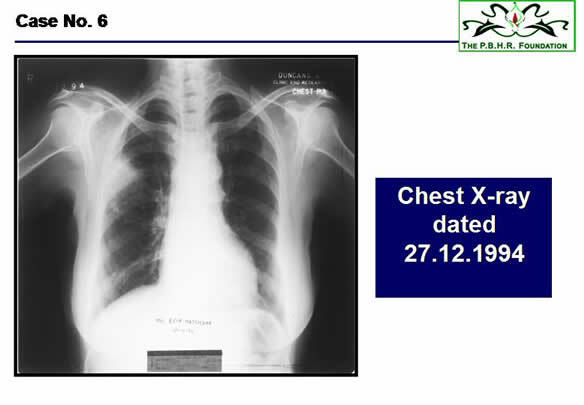 Clinically the patient presented with loss of weight, anorexia, nausea, vomiting, chest pain with restricted movement of the chest wall in the right side, increased vocal fremitus and moderate crepitations. 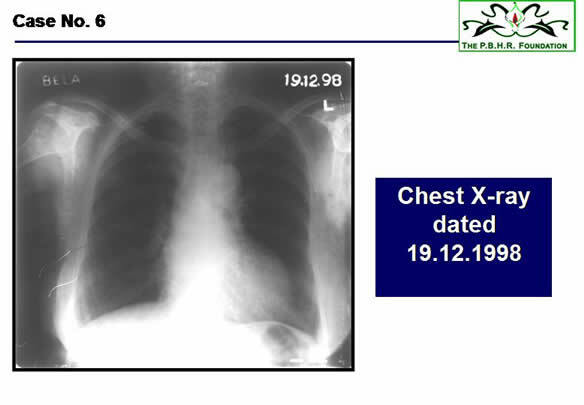 X-ray chest (PA view) dated 27.12.1994 shows “…homogeneous triangular opacity of consolidation is seen in right mid zone”. 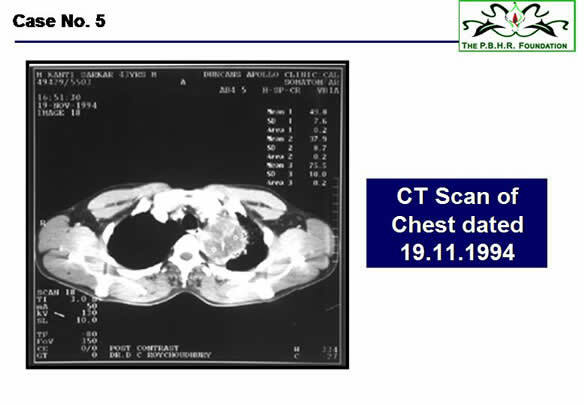 CT guided FNAC from right lung mass dated 09.01.1995 “ carcinoma lung (small cell type)”. 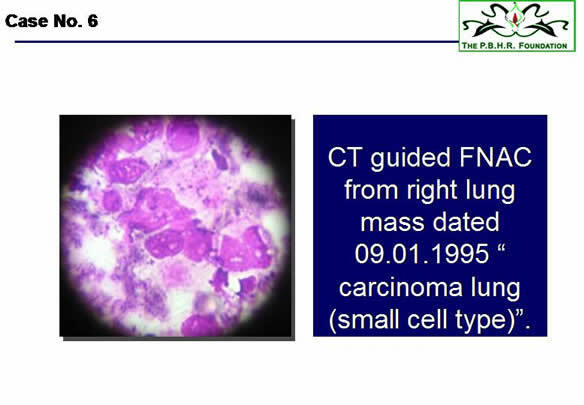 (NCI Slide 2) In MD Anderson Hospital Houston, Texas it was described as a diagnosed case of Malignant Neoplasm Consistent With Non-Small Cell Carcinoma According to TNM classification of tumor in this case the growth was T (8.0cm x 6.4cm) N1M0 Stage III. 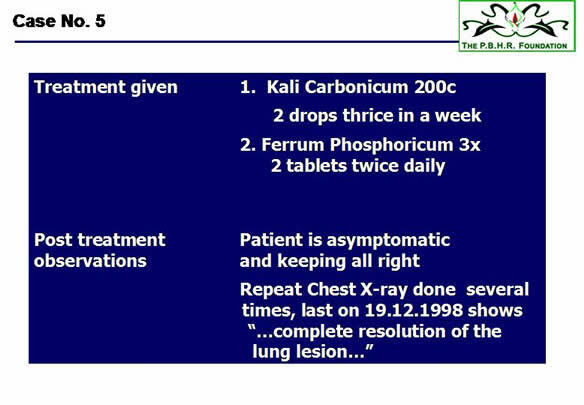 After undergoing treatment from us with the medicines Kali Carbonicum 200c 2 drops thrice in week and Ferrum Phosphoricum 3x 2 tablets twice daily. Patient is now asymptomatic and keeping all right. 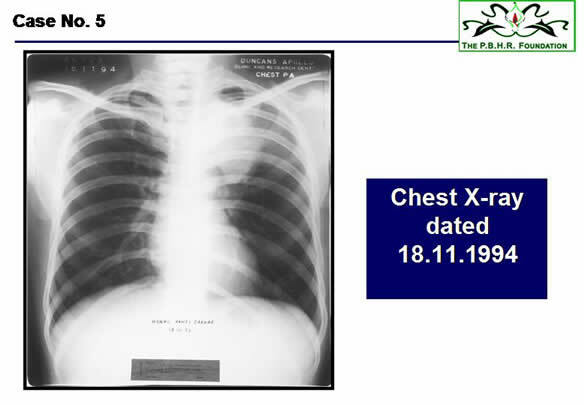 Chest X-rays done on several occasions last on 19.12.1998, which show that there has been complete resolution of lung lesion. There were no complications during treatment. 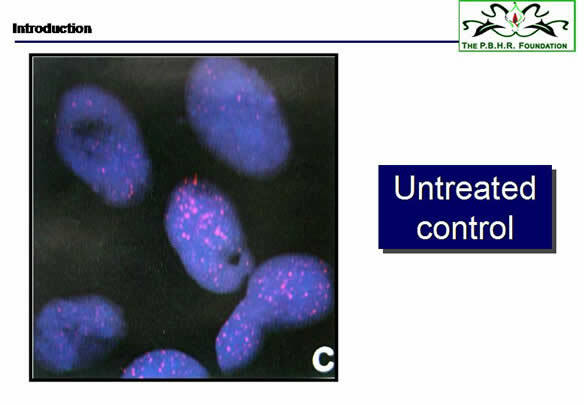 – All plates together It is very difficult at present to explain how Kali Carbonicum can regress Bronchogenic carcinoma, however carcinogens in tobacco smoke e.g. NNK stimulates potassium channel in different tissues, including lung. 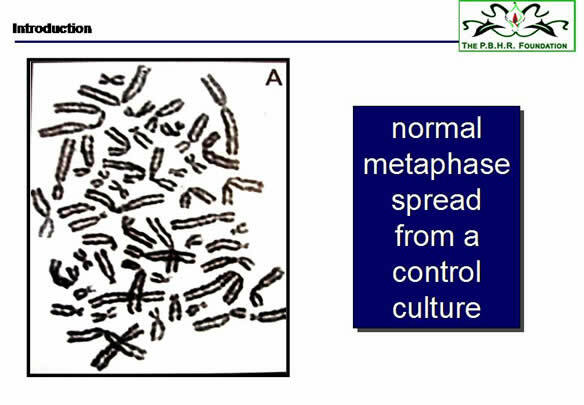 Again ATP-sensitive potassium channel openers have been proven to be involved in protection of damaged lung tissue. Thus, Kali Carbonicum may act through these pathways. 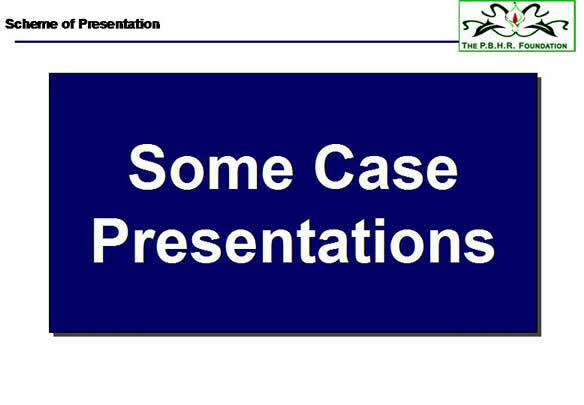 Case No 7. 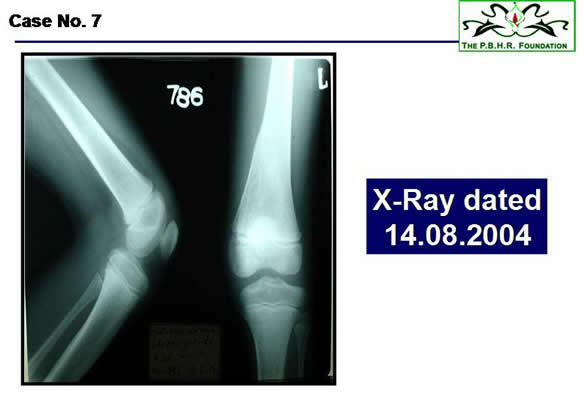 Osteogenic Sarcoma. 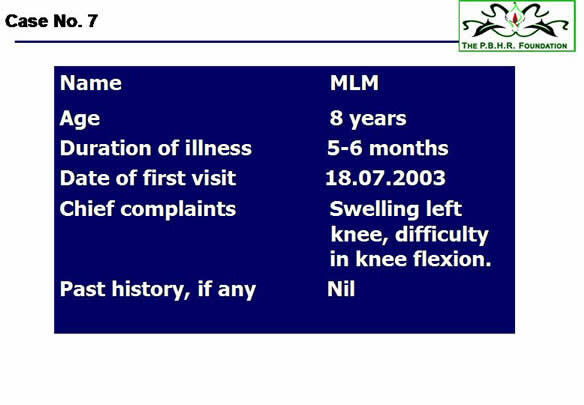 M L M, male, aged 8 years was suffering for 5 to 6 months with swelling in left knee and difficulty in flexing the knee, when he came to us for his treatment on 18th July 2003. 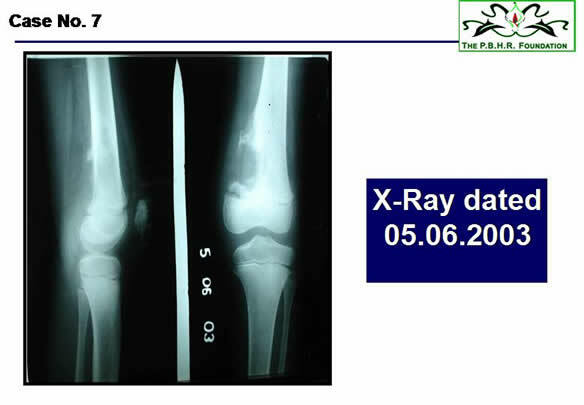 Clinically the Patient presented with a non tender, firm to hard swelling over the left knee joint. 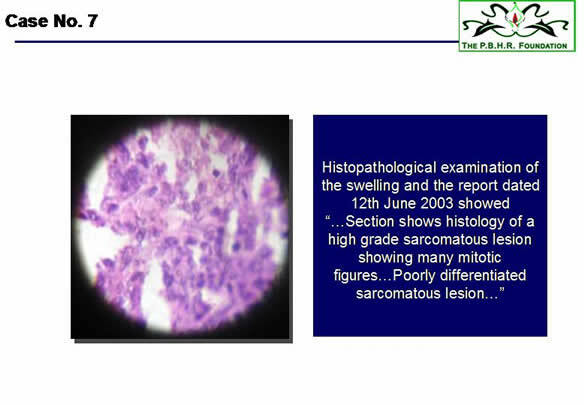 The child underwent Histopathological examination of the swelling and the report dated 12th June 2003 showed “…Section shows histology of a high grade sarcomatous lesion showing many mitotic figures…Poorly differentiated sarcomatous lesion…” At that time the parents of the child were advised at the Chittaranjan National Cancer Institute, Kolkata, to allow immediate “…above the lesion amputation…” of the affected leg. 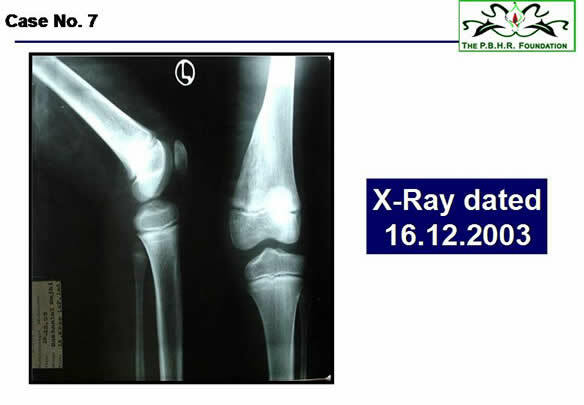 After undergoing treatment from us with the medicines Symphytum 200c two doses a day, Calcarea Phosphorica 3X two doses a day and Carcinosin 30c one dose every alternate day, the swelling gradually subsided and now the architecture of the knee has completely returned to normal. Patient is now asymptomatic and living his normal life. There were no complications during treatment. 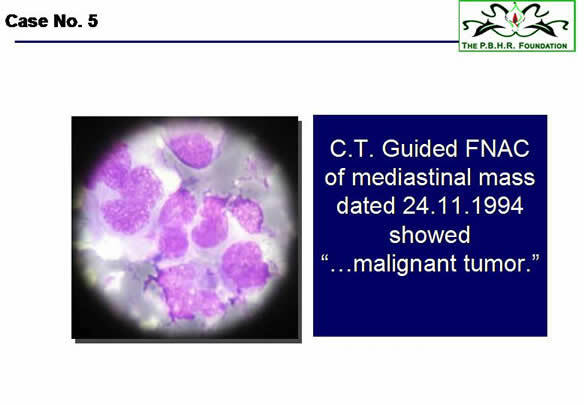 In this lecture I have presented only seven proved malignant tumor cases who were regressed following treatment with specific homeopathic medicines - Kali Carbonicum and Ferrum Phosphoricum for bronchogenic carcinoma, Condurango for oesophageal carcinoma, Ruta and Calcarea Phosphorica for brain tumors and Symphytum for the Osteogenic Sarcoma. Most of these cases were followed up and found normal even after five years. We have studied thousands of similar cases and promising results have been obtained in many instances. No presentation can be complete if we do not give tribute to our team of Doctors and accessory staff who help us to run our clinics….